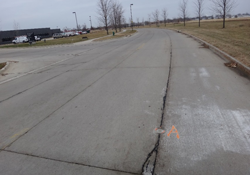 Premature deterioration of concrete at the joints in concrete pavements and parking lots has been reported across the northern states. The distress may first appear as shadowing when microcracking near the joints traps water, or as cracks parallel to and about 1 inch from the saw cut. The distress later exhibits as a significant loss of material. Not all roadways are distressed, but the problem is common enough to warrant attention. The aim of the work being conducted under this and parallel contracts was to improve understanding of the mechanisms behind premature joint deterioration and, based on this understanding, develop training materials and guidance documents to help practitioners reduce the risk of further distress and provide guidelines for repair techniques. While work is still needed to understand all of the details of the mechanisms behind premature deterioration and the prevention of further distress, the work to date has contributed to advancing the state of the knowledge.